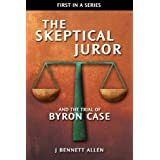 Reader Lando is the winner of the first ever Skeptical Juror Brain Teaser. 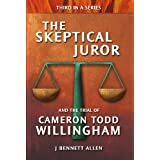 I hereby award Reader Lando the 10 attaperson points I promised, and I immediately convert them to Skeptical Juror points. All future awards will be in Skeptical Juror points, and I will keep a running total. 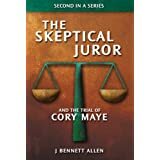 I may eventually convert the Skeptical Juror points to physical script, though I don't want to run afoul of federal banking laws. Reader Lando recognized correctly that the Consent to Search form was a composite document formed by placing the text block of a Consent to Search form over the signature block of some other form. (More specifically, the text block was placed over the upper half of an HPD Form No. BT-0012.) When one constructs such a composite form, particularly one so cheesy as the HPD Consent to Search form, the form becomes slightly three-dimensional. Copiers frequently fail to conceal the edges of the upper layer. I present once again the Consent to Search form below, this time placed alongside its sister Consent for Samples form. The annotations are mine. Click to enlarge. 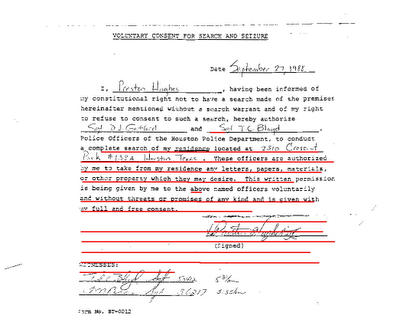 "I, Preston Hughes, having been informed of my constitutional right not to have ..."
"This written permission is given by me ... voluntarily without threats or promises of any kind and is given with my full and free consent." The only substantive differences between the upper portions of the two forms are the edge marks that Reader Lando so attentively noticed. Reader Lando, on the other hand, made no mention of the many differences on the lower portions of the two forms. In fact, it suddenly seems as if the two forms are not siblings. They're distant cousins, at best. The signature blocks are formatted differently, and one has an actual form number while the other does not. Also, Sgt. Ross's handwriting seems to have undergone a remarkable transformation in the two hours since she allegedly signed those two documents. 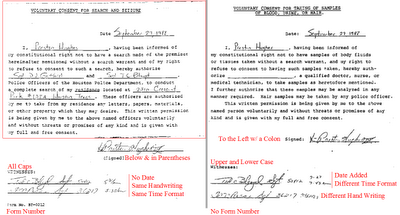 In the Consent for Search form, her handwriting (when writing the time) looks remarkably similar to that of Sgt. Bloyd. In the Consent for Samples form, she wrote the time so carelessly that one might suspect someone else wrote it for her. 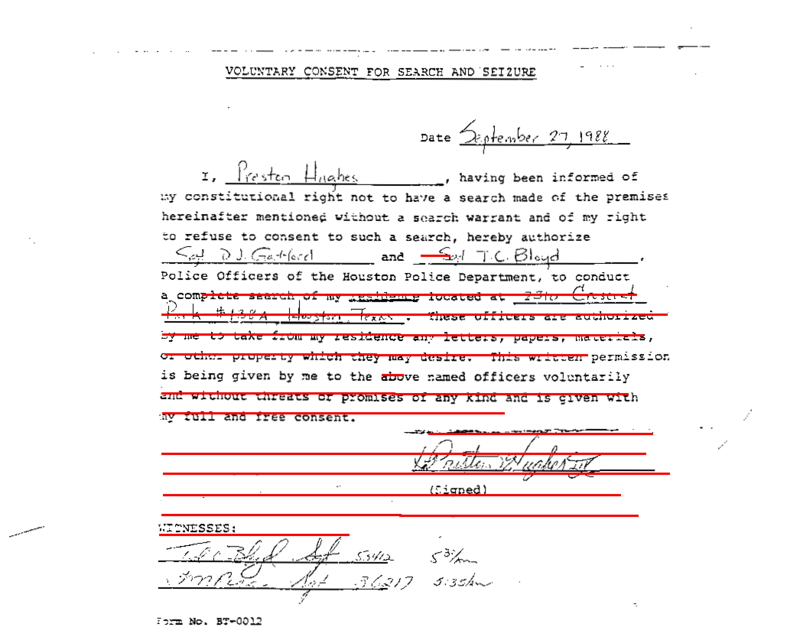 In summary, it appears as if the fine folks at the Houston Police Department took a blank Consent to Search form, filled in the information they wanted, cut or tore the text block from the form, taped the text block over a different form that Preston Hughes had in fact signed, and then copied the menagerie. Their forgery, however, was no more professional than their investigation in this case, and evidence of the falsification has been preserved lo these many years. I figured if they pasted that text block over the upper portion of Form No. BT-0012, they may not have aligned everything properly. So I checked to see if the text and underlines are parallel, upper to lower halves. They are, within the accuracy expected photocopied and scanned images. So I checked to see if the text columns are properly aligned, upper to lower halves. They are, within the accuracy expected of photocopied and scanned images. So I checked to see if the lines are spaced consistently, upper to lower halves. They are not. Now I can move these red lines down and see if the typed text in the lower half was typed on the same sheet of paper on a single pass through a typewriter. (Recall that this was in 1988.) The only typed text in the lower half (in the same font as the upper half) are the words Signed and WITNESSES. Here's what I got. When I kept the upper text properly underlined, the lower text was not properly underlined. Something's amiss. 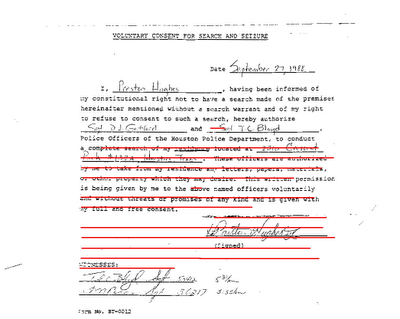 So I moved the lines up just a bit, so that they properly underlined (Signed) and WITNESSES. Not surprisingly, given the previous image, that didn't work either. There is no way I can get the upper text to be underlined properly at the same time I can get the lower text underlined properly, and vice versa. Something happened to throw the line spacing off between the upper and lower halves, and it happened just about where there seems to be an edge mark, just above Preston's signature. The entire case against Preston Hughes III depends on the veracity of the Houston Police. We must believe Sergeant Hamilton when he claims that Shandra provided him a dying declaration, though no one else heard that declaration, and though Shandra was statistically likely to have been unconscious. 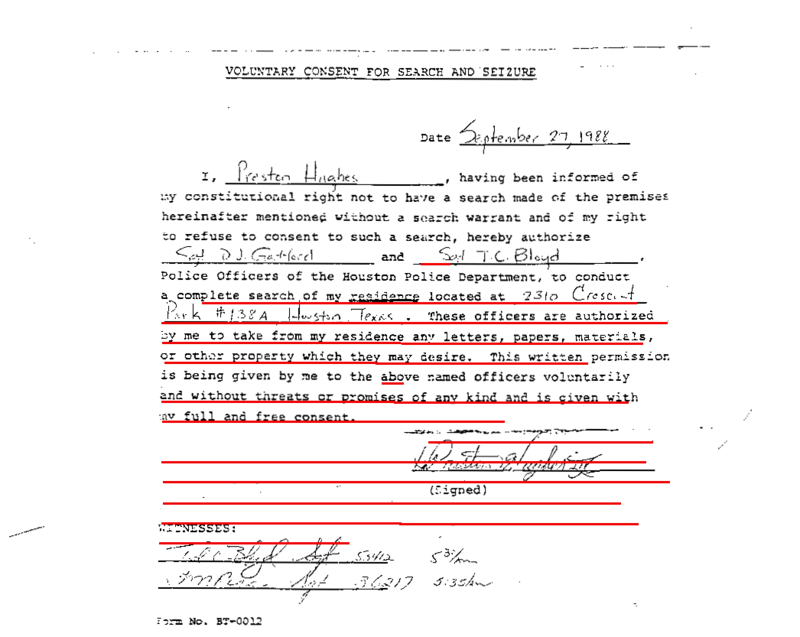 We must believe Sergeant Gafford when he claims that he did not coerce the first confession, because Gafford chose not to record the interrogation. We must believe Sergeants Ferguson and Yanchak when they claim they did not coerce a second, entirely different confession, because Ferguson and Yanchak chose not to record the confession. 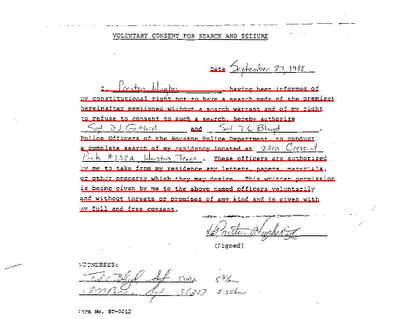 We must believe that the HPD did not plant Shandra's eyeglasses (or somebody's eyeglasses) in Preston's apartment, though the Evidence Inventory form makes it clear the police re-entered Preston's apartment before 2:58 AM, at least 2.5 hours before Preston allegedly signed the consent to search form. If the Consent to Search Form was falsified, as it now so clear it was, then we would be simply foolish to take the HPD at their word on this case. Now, having completed this brain teasing interlude, I shall return to plodding carefully through the data. For me it is unfortunately no surprise that the police sometime manufacture evidence. For some of you readers, I suspect it will come as a disillusionment. You sure wasted a lot of time and energy jumping to that false conclusion that the Consent to Search was forged/falsified. As you yourself noted, this was 1988, before the wide use of word processing. 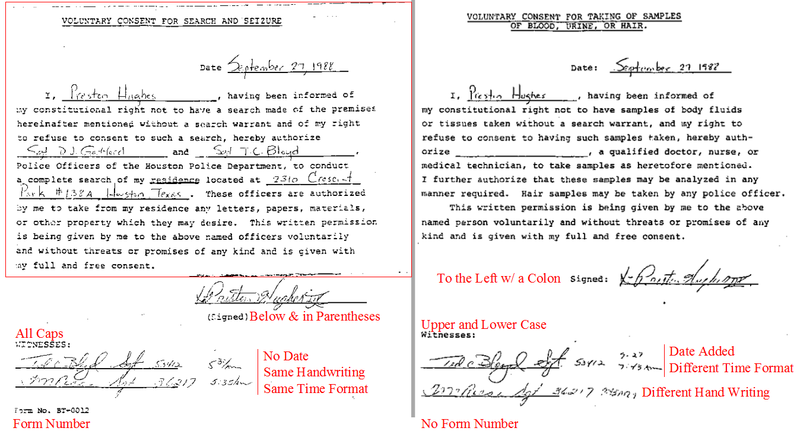 It was VERY common for law enforcement officers to cut and paste (back then, literally cut and paste) sections of blank forms to make other blank forms in order to eliminate a lot of duplicate typing. 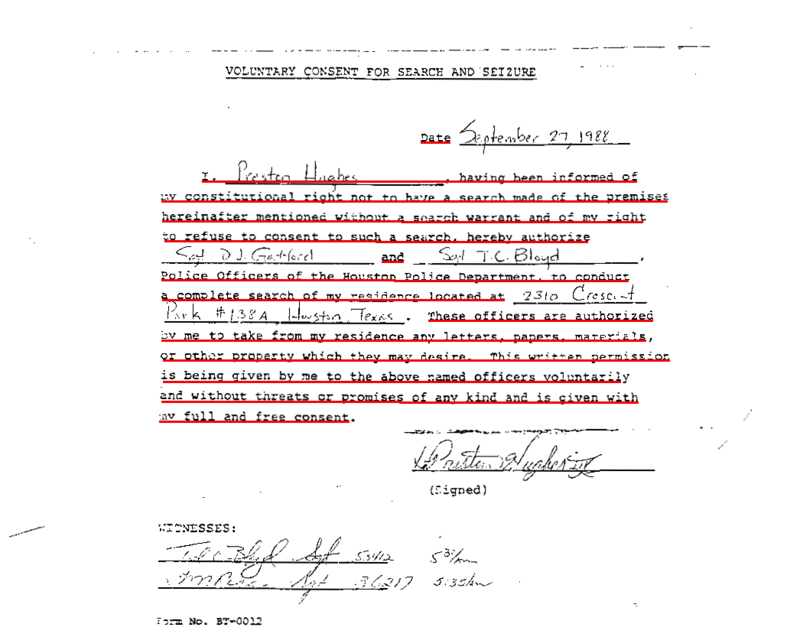 What you have "uncovered" is a blank consent form, made from one or more other forms, that was then filled out and signed by the suspect and the officers. I'd wager there are hundreds of nearly identical "falsified forms" in other Houston PD cases from that same period. I don't think so Patman. We had secretaries back in 1988 who could whip up that form in < 5 minutes... faster than an officer could doctor the BT-0012. But wait... this was the first consent form ever required by the HPD for search and seizure? Really?